Last week, the yield on the U.S. 10-year Treasury note dipped below the yield on the 3-month paper. The yield curve — which plots bond yields from shortest maturity to highest and is considered a barometer of economic sentiment — inverted on Friday for the first time since mid-2007. The yield on theU.S. 10-year Treasury noteon Friday dipped below the yield on the 3-month paper. It was the first time since mid-2007 that the yield curve — which plots bond yields from shortest maturity to highest and is considered a barometer of economic sentiment — inverted. CNBC takes a look at what this means. A yield curve is a graph that depicts yields on all of the U.S. Treasury bills ranging from short-term debt such as one month to longer-term debt, such as 30 years. Normally, shorter-dated yields are less than longer-dated ones. The curve, in a normal market environment, is upward sloping as bond investors are likely to get higher rates in a longer-term market environment as opposed to short term. That's because the perceived risk in a longer-term environment is higher. In rare settings, this yield curve starts to get inverted, meaning longer-dated yields are lesser than shorter-dated yields. An inverted yield-curve occurs when long-term debts have a lower yield as compared with short-term debt. If you drew a line between them on a graph, it would be an upward sloping curve, starting with the 2-year on the left and moving to the 10-year on the right. The higher rate for the longer-term bond compensates an investor for the greater risk that inflation will chip away at the value of that investment over time. Higher long-term rates reflect expectations that growth will continue. But when the difference between the short- and long-term rates narrows, it's a signal that people are less certain that growth is here to stay. The yield curve is a barometer of this sentiment. At 9 a.m. ET Monday, the yield on the 3-month bill was just shy of that on the 10-year note around 2.46 percent. The short-term rate last week exceed that of several longer-term securities. The yield on the benchmark 10-year Treasury note, which moves inversely to price, was higher at 2.428 percent, while the yield on the 2-year Treasury note was also higher at 2.279 percent. Investors are often motivated by short-term market players when making decisions. Shorter-dated bonds are highly sensitive to the Federal Reserve policies than longer-dated bonds. However, longer-term bonds are more sensitive to inflation expectations in the economy as inflation eats into the purchasing power of a bond's future performance. In simple terms, the higher the current rate of inflation and the higher the expected rate of inflation in the future, the higher the yields will rise across the yield curve, as investors will demand this higher yield to compensate for inflation risk. When the Fed starts to raise rates, signaling a stronger economy, that pushes up yields as investors sometimes tend to get rid of shorter-term bonds and move into riskier assets. However, when investors see inflation expectations for the longer-term stable, as is the case with the U.S. economy currently, they tend to move into longer-term safe-haven bonds, even though they may offer modest yields. The latest inversion between the 3-month and 10-year bond yields was a result of several factors such as Fed's dovish signal over rate hikes in 2019 and a whole set of disappointing data in Europe, along with the uncertainty surrounding Britain's exit from the European Union. On Friday, Germany's 10-year government bond yields slipped into negative territory for the first time since October 2016. German government 10-year bond, an important benchmark for European fixed income assets, is viewed as a safe haven for investors. In times of uncertainty and challenging market environment, investors tend to move their investments from riskier assets into safe havens like gold and German government bonds. The bond yields hitting negative territory shows there is a rising demand for the 10-year paper due to the ongoing uncertainty in the euro zone economy being fueled from a slowdown in Germany, a deadlock among politicians on Brexit, among other issues. An inverted yield curve is generally considered a recession predictor. It won't be immediate, but recessions have followed inversions a few months to two years later several times over many decades. When short-term yields climb over longer-dated yields, it shows that borrowing costs in the shorter-term are more than the longer term. In these cases, businesses could find it more expensive to expand their operations. Meanwhile, consumer borrowing could also fall, thus leading to lesser consumer spending in the economy. All of these could lead to a subsequent contraction in the economy and a rise in unemployment. Does it mean a rate cut from the Fed then? Last week's inverted yield curve took traders to increase their bets on the likelihood that the Fed will look at a rate cut – a U-turn from its current policy. 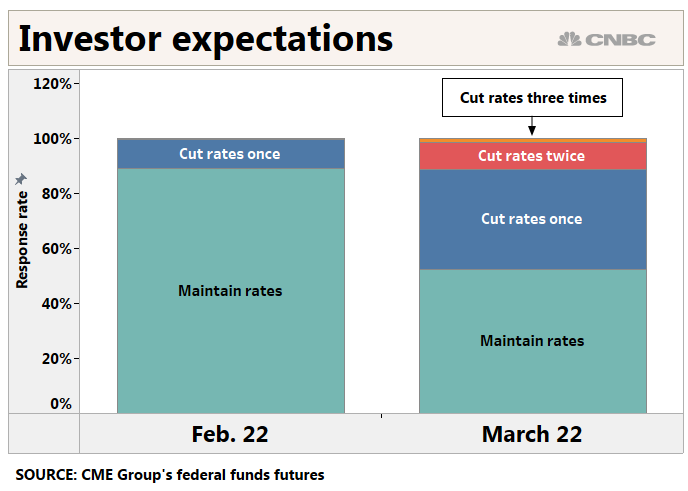 Federal funds futures, a measure used by traders to place bets on Fed's pace of rate hikes, showed the market pricing in a nearly 60 percent chance of a rate cut by December 2019. Janet Yellen, former chair of the Federal Reserve, said Monday that the recent triggering of a recession indicator in the U.S. bond markets could signal the need for a rate cut and not a prolonged economic downturn. "In contrast to times past, there's a tendency now for the yield curve to be very flat," she said, adding that it's now easier for it to invert — which traditionally meant investors had become concerned about a future downturn. "And in fact, it might signal that the Fed would at some point need to cut rates, but it certainly doesn't signal that this is a set of developments that would necessarily cause a recession," Yellen added.